When the CAS hired me back in June 1997, I was prepared to take on Actuarial Review. I had years of experience working on a weekly publication as well as a decent stretch on a monthly tabloid with advertising. AR was a quarterly and, at the time, it seemed like a welcome respite. The Actuarial Review had a rich history that Tim Tinsely, the CAS executive director at the time, readily shared with me. The first CAS Newsletter appeared in 1970. It was a typewritten, one sheet of paper that was probably mimeographed. (I can just smell the scent of the mimeo ink!) The legend goes that Matt Rodermund and his wife, Edyth, wrote, edited and published the newsletter from their basement. And so, AR had set the stage for deep volunteer involvement. By the time I started at the CAS, the newsletter was officially named Actuarial Review and had evolved into a quarterly, 16-page newsletter using two colors, CAS blue and black. Color printing back then was very expensive for many organizations. We made do with duotone photos when we wanted to get fancy. AR had no advertising then, but it would plug the upcoming meetings and seminars in small articles written by program volunteers. With the passing months, the newsletter grew in page count, from 16 to 20 and up to 36 pages. For years before the switch to the current magazine format, I said that AR was a magazine masquerading as a newsletter. In the beginning, it was just me, Parker Boone and Paul Lacko working with Walt Wright, our managing editor. Stan Khury was editor in chief (EIC) at the time, but would soon retire from the newsletter and become editor emeritus. Walt then became the EIC and I took on the title of AR managing editor, as I was already working in that capacity. In those early days, my mood, if not my workload, was lifted by the fact that I had the assistance of two dedicated volunteer copyeditors. Parker, Paul and I made a good team. Parker possessed not only a great writerly name, but an eagle eye for typos and a way with refining copy. Paul delved deep into the intents of the authors and engaged them directly with probing queries. Both men brought different skills to the work. They complemented each other well. Paul was happy to stay at Safety National in St. Louis, where he works today. Parker, on the other hand, was like a lot of CAS members during the late ‘90s and worked at a lot of different places. One such place he worked was for a small start-up called Esurance. Our leader, Walt, had a great interest in the history of the CAS, and he later used his enthusiasm to work on the CAS Centennial History book. While he has long been retired from the AR, Walt still writes an occasional column highlighting works from 25 years ago in the AR. Paul Lacko took over from Walt and proved to be a prolific EIC. Paul wrote thought-provoking columns. He wrote about life in general as well as actuarial items. His love of language came through in his columns. Today, Actuarial Review has definitely grown — changing its format from newsletter to magazine, hiring freelance writers and designers, and adding color and advertising. AR boasts 26 volunteer copyeditors and teams of content producers for humor, science, puzzles and member downtime. AR volunteers tend to serve beyond the usual three-year term. I have had the pleasure of getting to know a lot of volunteers through AR. These volunteers have enriched the publication, but they have also enriched my life through their dedication and love of the written word. 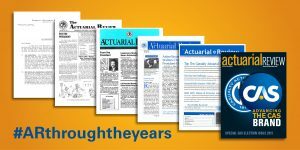 Our current social media campaign #ARthroughtheyears has allowed me to look back at some of my fondest memories of the Actuarial Review. Join us on Facebook or Twitter to join in our retrospective, or please share your comments below. What are some of your favorite AR memories?